MVNCALL is a program developed for genotype calling and phasing using low-coverage next-generation sequencing reads information. The software assumes a study design where the samples are sequenced and also genotyped in a microarray. The approach assumes that the microarray genotypes have been phased using a haplotype estimation program. We recommend SHAPEIT for this purpose. The phased haplotypes then serve as a haplotype scaffold in MVNCALL. Then, each polymorphic site is phased one at a time onto the haplotype scaffold. In the figure below illustrates how MVNcall works. The method implements an MCMC algorithm in which unobserved genotypes are iteratively updated. The figures illustrates how a site s is phased onto the haplotype scaffold. At each iteration, the posterior genotypes of an individual (in purple) are estimated given the (i) haplotype scaffold (in blue), (ii) the genotypes at the site at all other individuals (in green), and (iii) the flanking haplotypes of the individual in a given iteration (in orange). It requires low RAM usage. MVNcall is freely available for academic use. To see rules for non-academic use, please read the LICENCE file, which is included with each software download. Pre-compiled MVNcall binaries and example files can be downloaded from the links below. For Linux machines, the dynamic binaries are smaller but may not work on some machines due to gcc library compatibility issues; if the dynamic version doesn't work for you, please try the static version. If you have any problems getting the program to work on your machine or would like to request an executable for a platform not shown here, please send a message to our mail list. The latest software release is v1.0. We support only the most recent version. (Other file decompression programs are available for non-Linux computers.) This will create a directory of the same name as the downloaded file, minus the '.tgz' suffix. Inside this directory you will find an executable called mvncall, a LICENCE file, and an Example/ directory that contains example data files. We show how to perform various kinds of analyses with the example files here. This section provides some example commands that illustrate typical applications of MVNcall. All of the data files used in these commands are included in the Example/ directory that comes with the software download. You should run the commands from the main download directory (i.e., the one that contains the mvncall executable). Detailed explanations are provided at each link below. Imputation with default parameters Basic scenario in which most people will use MVNcall. Imputation with model averaging option As above, but with model averaging which averages over two models. Imputation with duo/trio related samples As above, but with related samples. All of the data files in the example commands below are included in the example/ directory that comes with the MVNcall software download. You should run the command from the main download directory, which is the one that contains the mvncall executable. For example, if you just downloaded a software package named mvncall_v1.0_MacOSX.intel.tgz and unpacked it according to the directions here, you can reach the appropriate directory by typing "cd mvncall_v1.0_MacsOSX.intel/" on the command line. Note that most lines in the example command end with the '\' character. This is not actually part of the command; it is just a shorthand notation that means "keep reading the next line as part of a single command." We use this notation to split the command over multiple lines so it is easier to read. This is a valid way to enter commands in a Unix-style terminal window, but it would be equivalent to put all of the arguments on a single line, separated by spaces. You do not have to run MVNcall exactly as in the example. Some of the arguments shown here are optional, and there are many other options that could be added to modify the behavior of the program. For a full list of available options, see here. Most of the examples below include the string "--int 20400000 20500000", which tells the program to produce results for a 100 kb region (positions 20,400,000-20,500,000) on a single chromosome. MVNcall assumes there is only one chromosome per input file, and that all input files in a single run come from the same chromosome. Applying the program to a much larger region�say, a whole chromosome or the whole genome�requires running many such jobs with different values of the --int parameter, usually in parallel on a computing cluster. This is the default scenario using the default parameters (for --iteration, --burn-in, --lambda, --numsnps). Here we input the --sample-file which corresponds to the order of the haplotypes in the --scaffold-file. The --glfs file is in vcf format. Care should be taken that the ids in the --sample-file match the ids in the --glfs file. The --int specifies the interval of sites to be imputed. Only sites that are present in the --glfs sites will be imputed. In the case where a site is present in the --scaffold-file, no imputation is performed, and the site is kept the same as in the --scaffold-file. The --o provides the phased genotypes at the sites analysed in a vcf format. The default values for the other parameters are used for the imputation of the Phase 1 of the 1000 Genomes Project. For different study designs those parameters might need to be modified. The number of conditioning haplotypes (--k) is fixed to a single value. In order to run MVNcall with two values of --k, one specified by the --k flag and the other with all available haplotypes, the model-averaging option can be used. The two models are ran simultaneously and the averaged posteriors are used to infer the phased genotypes. This procedure seemed to help the imputation of the Phase 1 1000 Genomes data. The --model-avg option runs the model with two values of --k (100 and all haplotypes). For low coverage sequencing data, the model averaging option was preferred since it provided lower genotype discordance rates. The computational time is however increased. We recommend you first test the --model-avg option in a small region and compare the genotype discordance with the model ran on a single value of --k before applying it to larger regions. Instead of choosing an interval through the --int flag to impute with MVNcall, a list of sites can also be inputted where the physical positions of the sites analysed are inputted, one in each row. Note that no chromosome is required in the list, since MVNcall assumes that a single chromosome is inputted. This scenario assumes that the samples are related (either duos -parent,offspring-, or trios -both parents,offspring-). We highly recommend to use the known relationships of the samples, if available, since this has shown to significantly help both the imputation and phasing of the samples. The --ped-file should follow this format. Make sure that the ids in the ped file agree with the ped files in --sample-file. The transmitted haplotypes in the --scaffold-file should be: father transmits the first haplotype to the first haplotype of the offspring, and the mother transmits the first haplotype to the second haplotype of the offspring. This is crucial for running the pedigree related model. REQUIRED none File containing the haplotypes of the samples as specified in the sample file. Each row corresponds to a SNP and each column to a haplotype. The first five columns of the file give information regarding the chromosome, the position, and the alleles. For more details see here. REQUIRED none The glfs file is a vcf format file that contains the genotype likelihoods of the sites to be analysed on the same set of samples that are in the sample file. The genotype likelihoods can be in GL or PL format. When multiple variants have the same physical position, the output will contain pseudo-positions with +1 from the input position. The option supports .gz format. The ped-file contains the duo/trio relationships between the samples studied. The file must follow this format. When a ped-file is not given, then the individuals are assumed to be unrelated. For more details on the format see here. Genomic interval to use for inference, as specified by <lower> and <upper> boundaries in base pair position. The option is useful for splitting the chromosome in multiple regions and run them parallel. 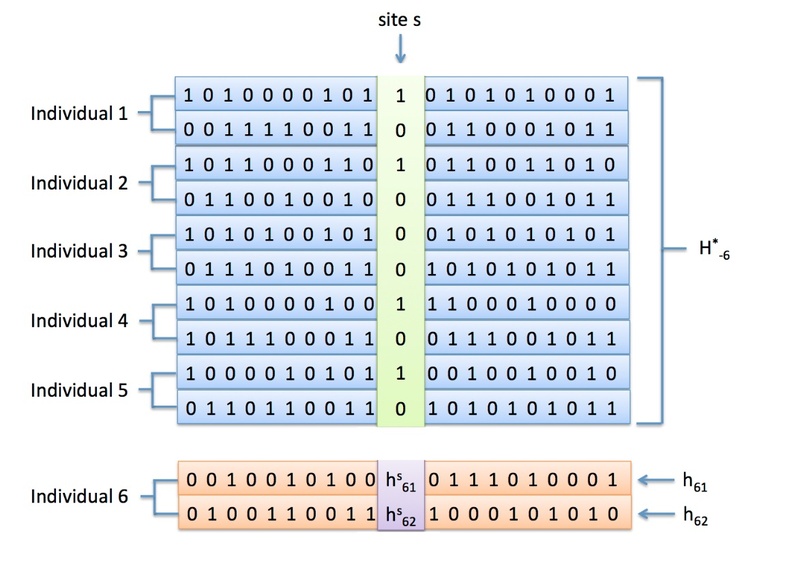 The number of flanking sites that is going to be used for inference at either site of the site of interest. The penalty parameter added on the diagonal of the variance-covariance matrix. The higher the value of lambda, the more weight is given to the GLs and less to the LD structure to calculate the posterior probabilities of genotypes. The default value is suggested for low/medium coverage data. Model average flag will run MVNcall twice: once with the value of k as indicated in --k, and another one with k equal to all haplotypes. Total number of MCMC iterations to perform, including burn-in. Increasing the number of iterations may improve accuracy, depending on the number of samples and the depth of coverage. Number of MCMC iterations to discard as burn-in. Examples of file formats required as inputs in MVNcall are provided. Sample file (--sample-file): The order of the samples in the haplotype files are required in all analyses. The sample file contains the IDs of the samples, one in each row. No header file is required. Scaffold file (-scaffold-file): The study design assumed by MVNcall includes a phased haplotype scaffold. A haplotype scaffold is built by phasing microarray genotypes on the same set of samples that are sequenced. We recommend SHAPEIT2 for building the haplotype scaffold. The output of SHAPEIT2 includes the HAPS and SAMPLE file formats for haplotypes. The scaffold file has the same format as the SHAPEIT2 HAPS files. The subsequent column pair (6,7), (8,9), (10,11), (12,13) corresponds to the alleles carried at that SNP by each haplotype of the four individuals. Output file (-o): The output file is in vcf format. The phased genotypes are given using the vcf notation, i.e. 0|0, 0|1, 1|0, 1|1. IMPORTANT: If you are having a problem with the software, please include the following details in your e-mail; otherwise, we may not be able to diagnose the problem. The version number of MVNcall and the type of computer you are using to run it�e.g., "MVNcall v1.0 on Mac OSX 10.6". For difficult problems like memory access errors (e.g., "segmentation faults"), we may need you to send data files that show the problem. These files should ideally be small, and we can provide suggestions if you are not allowed to share your actual data.